Alex Meixner ('01 M.M.-trumpet) is currently appearing in a national commerical for Hormel Pepperoni. This is the latest of five commercials in which Meixner appears as a "one man pep band" to advertise the Hormel product. Meixner also recently recorded the soundtrack for the upcoming movie “The Polka King,” starring Jack Black portraying the life of Jan Lewan. The movie had a limited release at this year's Sundance Film Festival and is due for general release later in the 2017. Alex's musical life began at age 6, playing with his two sisters and father in an ethnic folk ensemble. From these early experiences to headlining appearances at music festivals throughout the United States, and concert performances with the London Symphony Orchestra, Sandy Duncan, and his own jazz and ethnic ensembles, he has developed a unique musical mix that appeals to a wide cross-section of audiences. To date, he can be heard on over 50 recordings. His formative musical studies were on piano and piano accordion, but he quickly branched out on drums, diatonic button accordion, bass, and trumpet - his major instrument at Penn State. This instrumental versatility is combined with a musical background that has included intense studies and performance of jazz, classical, pop, polkas, and many ethnic folk music genres with some of the leading artists in the world. His talents in music and comedy were featured on the Tonight Show on NBC in 2004. Alex also leads The Alex Meixner Band, considered to be one of the hardest working bands in polka music today. Performing over 100 dates throughout the United States annually, Alex and his band have presented their dynamic and high energy sounds at festivals as diverse as Wurstfest (New Braunfels, TX), National Folk Festival (Butte, MT); Cotati Accordion Festival (Cotati, CA); Gaufest (Sandusky, OH); Minnesota State Fair (St Paul, MN) and many of the largest Oktoberfests in the nation as well as concert halls, rock clubs, and ethnic organizations from coast to coast. 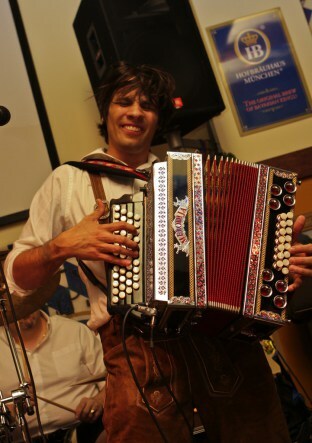 Alex, a Grammy nominee for his “Polka FreakOut” album with Bubba Hernandez is highly regarded for his traditional Austrian-German repertoire, as well as contemporary fusions with folk and pop music from around the world that make his shows entertaining for audiences of all backgrounds, while retaining the roots of the Alpine cultures that have developed in the USA.